Hokkaido Honey Apple Ale is a 5% fruit beer from Hokkaido Bakushu Jozo, based in Otaru, Hokkaido. It’s part of their all-year round range of craft beer and is brewed with locally sourced apples and honey from Yoichi, Hokkaido. It uses a pale ale though how and when the apples and honey are used is unknown. At the time of writing, Hokkaido Honey Apple Ale can be found in both bottles and on tap. Full of apples – though where is the ale base? Fruit beers – sometimes done well, and sometimes done badly, with at times, horrendous ones. With Hokkaido Honey Apple Ale, Hokkaido Beer have gone full on fruit with honey, which leaves me wondering where the line between ciders and ales is? As soon as the beer was opened, a huge waft of apple juice aroma comes out, followed by that raw sugar sweetness from the honey. If there was any other aromas, then either I missed them or literally couldn’t smell them due to the overpowering apples and honey. Hokkaido Honey Apple Ale poured out a light straw colour with a minimal amount of fluffy white head that quickly dissipated to a thin ring around the outside of the glass. Mead is a drink made from fermented honey, along with various fruits and spices, and is notoriously potent, ranging from around 10% to 20%. I imagine Hokkaido Honey Apple Ale to taste something like a watered down version of mead as that is really what is going on. 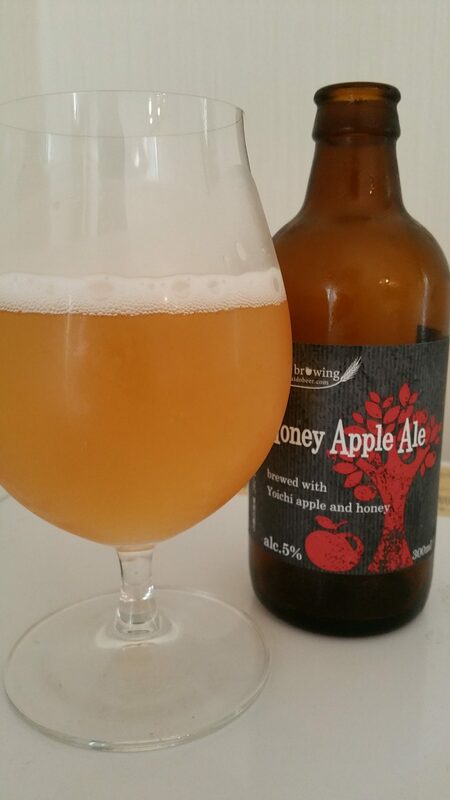 Full on apple juice and honey flavours with no discernable flavours from the ale base. The sweetness of the beer made me think I was in fact drinking a chu-hi and I could feel my teeth almost beginning to rot away from the sugar. It finished off leaving a lingering apple juice concentrate flavour and wasn’t as refreshing as I hoped. If you’re looking for a subtle fruit beer, then look somewhere else as Hokkaido Honey Apple Ale is neither subtle nor tastes like a beer. Go for a chu-hi instead if you want something fruity and highly alcoholic.